Mend-it is a "non-glue" which binds soft plastic baits together by chemically "melting" them, creati.. The Original Bondy Bait. 7.5", 7 oz Optional Blade Stickers: These are available with the purc..
Stealth's new 49 strand (7x7) 175-pound test 12" Stainless Steel Leader offers exceptional durabilit..
Musky Tackle Online recommends Pro's Soft Bait Glue as the best fishing glue on the market. Let’.. The new bait from Bondy Bait Co...The Hot Orba. This bait is made for slow rolling down long points .. The special part about the Bondy Bait Wobbler is that it wobbles really hard on a slow drop. It will..
Back by popular demand in 2019! 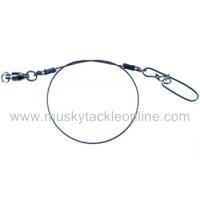 Just like the Original Bondy, only in a smaller size.5", 5.4 oz..